Coupon codes are widely used as an effective marketing tool and purchase incentive. Coupons can be used in a flexible way, whether for mass products sales, seasonal promotions, bundled products, or offering discounts to selected customers. You can always increase your customer loyalty, generate more traffic, and boost sales with the help of coupon codes. It is only necessary to choose a reliable Magento extension, and below we describe such tool from the portfolio of Aheadworks. Coupon Code Generator for Magento 2 and 1 is a flexible tool responsible for generating, delivering, and tracking individual coupon codes. Thus, having installed the module, you get a robust system that covers all aspects of coupon management. Coupon Code Generator brings high-quality code along with continuous functionality development to its users. Looks quite intriguing, so let’s look at the extension’s core features and backend interface. Integration with the Help Desk Ultimate. Coupon Codes Generator lets store owners create coupons for specified customers with predefined discount rules in different ways. First of all, it is necessary to mention that all coupon codes can be delivered to target customers automatically. 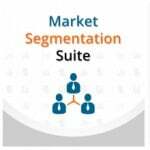 Besides, mass actions are supported for a selection of customers. Also, customers that have met specific cart or product conditions receive coupons automatically (if you enable the feature). Therefore, you do not have to waste much time on routine tasks. Furthermore, the extension supports custom variables, so you can easily add coupons to emails and newsletters. Since each coupon code has an expiration date, coupon recipients are motivated to purchase something on your Magento website before their coupons are disabled. Along with discounts and price drop, the coupon codes generator extension provides the ability to offer free shipping to coupon recipients. As for admins, they get a very user-friendly backend interface with tons of time-savers. For instance, there are custom prefixes that help to differentiate between coupons, for example, by promotion or sales agent. 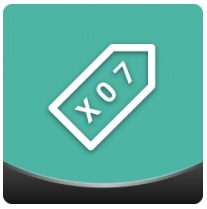 Each coupon generation rule gets individual usage statistics providing the ability to track its efficiency. With the feature, you can quickly understand which coupon rules are the most popular and successful and use this information for planning your sales campaigns. Besides, you can check coupon status and other info, since they are available right in the Magento admin. Integration with the Help Desk Ultimate extension allows selecting a coupon rule to instantly generate a coupon code right from the support ticket page. After a code is created, it is automatically included in a help desk reply. This functionality drastically improves customer service and builds stronger communication with online shoppers. The Aheadworks Coupon Code Generator Magento 2 extension is available under Marketing -> Coupon Code Generator by aheadWorks. Usage Rate (ratio of two previous columns). Note that you can rearrange columns order: just drag and drop each column. Besides, it is possible to choose which columns should be displayed or hidden from the grid in the Columns drop-down menu. Another possibility is related to the Export drop-down. 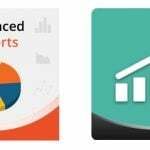 Here, the module lets you export data in CSV or Excel XML. As for available actions, they are: Activate, Deactivate, Delete. Each coupon rule screen is divided into five tabs: Rule Information, Coupon Usage, Code Format, Conditions, and Actions. 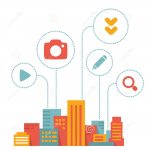 Under Rule Information, you can specify the name of a rule, its description, status (Active – Yes or No), websites, and customer groups for which this rule should be applied, as well as the rule priority. In Coupon Usage, you specify how many times each individual coupon should be used and set its expiration. You can choose 0 to disable limitations or enter any other amount of days to motivate your customers to visit your website and make a purchase. As for Code Format, this section lets you specify coupon length (without prefix, suffix, and separators) and code format (Alphanumeric, Alphabetical, Numeric). Then, it is a turn of prefix, suffix, and separators (Dash Every X Characters). As for Actions, first, you specify how to apply the rule: as a fixed amount discount, a percent of product price discount, a fixed amount discount for the whole cart, or “buy X get Y for free”. Then, you set a discount amount and specify maximum quantity the discount is applied to. Note that the next field, Discount Qty Step (Buy X), is related to the “buy X get Y for free” type. Next, you should decide whether to apply the discount to shipping amount, discard subsequent rules, and allow free shipping or not. Finally, you can specify conditions for cart items to be met to apply the rule. Leave this section blank to use it for all items. The same options are available when you create a new rule. Now, we will describe how coupons are generated with Aheadworks Coupon Code Generator for Magento 2 and 1. First of all, you can create a single coupon for email. You should specify recipient email, choose a rule that will be applied for the coupon generation, and tick Send Email with Coupon to Recipient to send a coupon automatically (alternatively, a manual copy/paste delivery via chat or other means is possible). Using the extension, you can also rely on mass actions. The second part of the Generate Coupons page contains a grid with customers. The grid supports filtering and sorting; besides, you can rearrange the way it looks by moving or hiding columns (27 columns are available). Tick customers you want to whom you want to send coupons and choose “Generate and Send Coupon” from the Actions drop-down. As for the extension’s general settings, here you have just two options: Email Sender (choose a sender from a drop-down list) and Email Template (choose a template that will be applied to emails with coupons). Integration with the Follow Up Email module. Allows using the module’s newsletter and follow-up templates and add coupon generator variables to them. Discard subsequent rules. New option added to the rules management. Rule priority. Adds an ability to determine the order for activated rules. Free Shipping option for coupons. The functionality allows creating coupon codes with the free shipping option automatically. Help Desk Ultimate integration. Allows Magento admins to provide coupons as a part of customer service process. Code refactoring. Includes architecture improvement, code style testing and validation, scripts upgrade, and more. 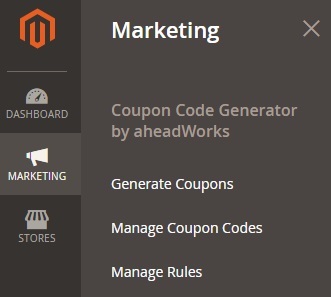 Aheadworks Coupon Code Generator for Magento 2 and 1 provides lots of flexible options for generating, managing, and tracking coupon codes. The extension has a user-friendly backend interface and offers all features necessary for running a successful coupon campaign. As for price, it depends on the Magento version, as always in case of Aheadworks. Thus, the Coupon Code Generator Magento 2 extension costs $199, including installation, 90 days of support, and personal account manager. Note that Aheadworks offers a 50% discount on the module upgrade for their Magento 1 customers. As for Aheadworks Coupon Code Generator for Magento 1, it costs $99 with 90 days of support included, but without installation service.